Last Saturday 82 Minnesota K-12 students became first-time published authors! 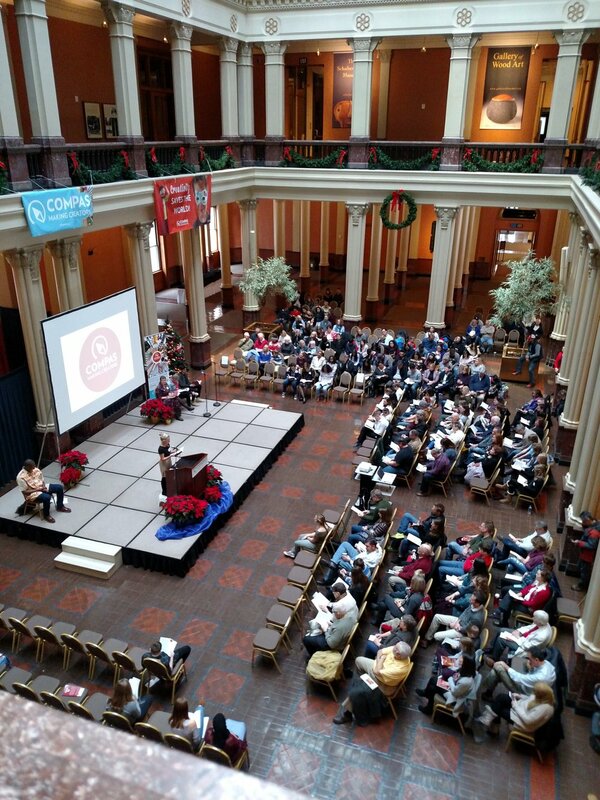 Over half of them were able to attend the 38th annual reading and celebration event COMPAS hosted at Landmark Center in Saint Paul. This year’s anthology, This Bursting Sound Within includes poems, stories, spoken word pieces, songs and even comics. The book features work from each Minnesota school that hosted a COMPAS teaching writer-in-residence during the 2016-2017 school year as part of the Creative Classroom program. The pieces included in the book were selected for publication from more than 4,000 pieces created by Minnesota students during the school year. All students were invited to read their pieces aloud for close to 300 family, friends, teachers and COMPAS Teaching Artists that attended. Nervousness was in the air before the students went up to read but they all put their fears aside and became a part of a long-standing tradition that gives pride, joy and confidence to its participants. The MC of the reading was none other than COMPAS Teaching Artist Frank Sentwali who energized the crowd and even honored us with a performance of an original spoken word piece. An extra bonus was having two of our 2016 published authors Solie Brosi and Salah Abdulkarim serve as announcers for the event. At the end of the ceremony eight outstanding writers were given the Lillian Wright Award for Creative Writing which recognizes literary achievement among young writers. COMPAS is already looking forward to our 39th edition of the anthology and submissions are already coming in. For every week of a writing program two student’s pieces are selected by the teaching artist as finalists for inclusion in the book. Join us next year for the reading and become a part of this long-standing tradition that brings pride, joy and confidence to your students. Copies of This Bursting Sound Within are still for sale. Don’t miss out on your chance to own the best collection of student writing in the state. Contact Emma to get your copy!